To get an occupancy certificate you need several things including: 1.) A heating system 2.) Potable water 3.) Be closed in 4.) Something to function as a kitchen sink and 5.) A fully functioning bathroom with a door that closes. We decided that the guest bath would be the easiest thing to do for our functioning bathroom. There will be a shower stall, a sink, and a toilet in a room 6'x6'. Here you can see the start of the process. We used cement board where the shower stall goes and regular drywall elsewhere. Note the shower drain sticking out of the floor. Remember back when we were laying out the septic pipes in the trenches under the floor ? That was a year before this picture was taken. Remember we said that we had to measure umpteen times to make sure they were in the right place? This is why. The centre of the drain needed to be 12" from each wall. Once the cement board is all up, we put in the shower pan. It slides into that gap you see in the above picture. The reason is that the tiles will cover the 1/8" or so gap between the shower base and the cement board. There is a flange on the top of the shower base so this provides a flat surface for the tiles to sit on. We used Pex everywhere in the house for our interior plumbing. It is AWESOME! Mark ran every line in the house from the multi-port manifolds in the utility room throughout the house in a day. It is super easy to work with and the fittings and clamps are dead simple to use. Here is the main valve for the shower in the guest bath. The hot and cold water come down from the ceiling to either side of the valve. The mixed water then goes up the wall to the shower head. This is what the whole thing looks like. This is the finished tile job. Looks awesome, eh? 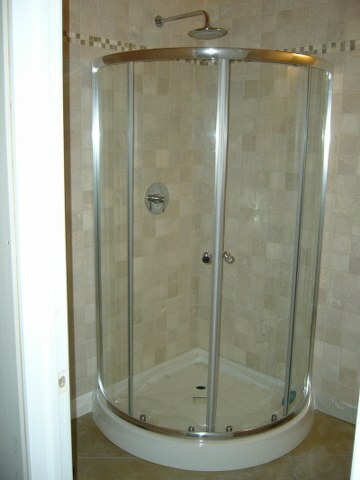 Here it is with the finished shower stall and the fixtures installed. 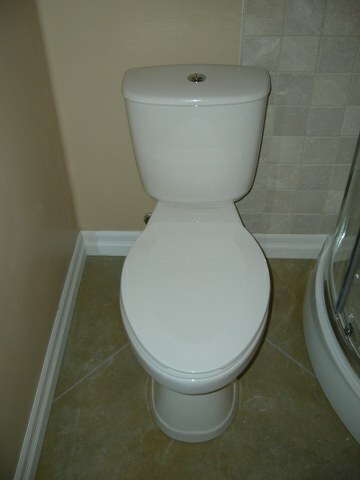 I know, who cares about a toilet, but I figured I might as well show it.